88Light will be present at the trade fair MATELEC in Madrid, Spain from November 13 to November 16. "International Exhibition of Electrical and Electronic Equipment". Matelec Expo is a 4 day event being held from 13th to 16th November 2018 at the Feria de Madrid in Comunidad De Madrid,Spain. This event showcases product from Electronics and Electrical Goods industry. If you need assistance in visiting us, just send us an email and we will be glad to assist you. 88Light will be present at the trade fair MATELEC in Madrid, Spain from October 28 to October 31. Come join us at Hall 4 Stand 4D10. We will be introducing our newest product line and energy calculation software program and App to the market. <Click here> to see the invitation. 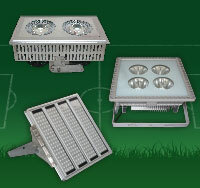 88Light introduces its new Sport Field Lighting Series to the market. Sport field is one of the highest energy users in the market due to the extreme high lumen it needs to illuminate from a high point as well as the different type of broadcasting needs a different type of lighting. With the introduction of its new Sport Field Lighting series SFL, 88Light objectives is to continue to help the industry to lower its energy consumption while keeping its high standard lighting needs. <Click here> to view our Sport Field Lighting Brochure. 88Light introduces the first candle light at 2200K into the market under the Series SUNSET into the Dutch Market and with fast introduction as well to the rest of the European Market which will be followed by a global introduction. We are extremely enthusiastic that this new color which suits perfectly for hotels, restaurants, bar, etc…that wants to give that very warm feeling (where the SUNSET Series name comes from) will be an instant success for the market and we have the initial introduction into the Dutch market to prove that we were right. Our Dutch customers have been very enthusiastic to change their lights with our 2200K Sunset Series as soon as they test it. <Click here> to read our first press release into the Dutch Market. 88Light will be present at the trade fair Salon des Mandataires in Belgium from February 7 to February 8. Come join us at hall 6 Booth 37. We will be introducing our newest product line and energy calculation software program and app to the market together with our partner iWatt. 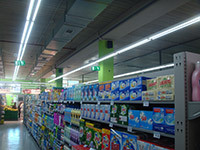 88Light was chosen to light up the new Carrefour Market in Cantabria, Spain; with this action 88Light is starting a new business opportunity focused in this market segment, Carrefour is expected to open at least 60 new stores in 2013 and our high lumen T8 tubes will be their preferred lighting source to provide them a big energy savings using the World's brightest LED lighting. 88Light expands its network in South Pacific with Sales offices in Taiwan, Japan and Australia together with LDI. 88Light will be present at the trade fair MATELEC in Madrid, Spain from October 23 to October 26. Come join us at Hall 4 Stand D09B. We will be introducing our newest product line and energy calculation software program and app to the market. 88Light has now joined its forces together with Compano, the leading technical online software and website for all installation companies in The Netherlands. Campano online software currently is used by more than 800 installers and purchase organizations combined across The Netherlands. Being part of this platform allows 88Light for greater exposure and easy access by all the installers to reach 88Light in providing them with the best LED Lighting solution. 88Light creates new standard in spotlight with 2500k 4W GU10 and GU5.3. 88Light is now a member of the Dutch Parking Network Association PNNL Parkeer Netwerk Nederland PNNL has currently more than 190 organization members consisting of parking owners, municipalities, operators, consultants, architects, developers, builders, investors, suppliers, including small and large companies all across the country. Being part of PNNL allows 88Light to present its LED lighting products and solutions to all members and to help them achieve a more efficient energy usage when it comes to their lighting usage. 88Light opens Branch office in Madrid, Spain. 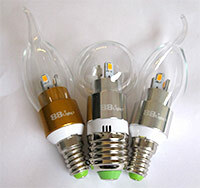 88Light obtains FCC Certification for the USA Market. 88Light introduces its EnerSaver calculation apps for iPhone and iPads for free download. 88Light introduces its EnerSaver calculation software on its website. This wed-based programs allows you to calculate your return on investment by swtiching from convential lighting to LED Lighting. It also allows you to take into account the cost of set up, labor and fixtures replacement as well. It will also show you the savings in Co2 that you will achieve every year. 88Light introduces high lumen T8 Tube of +110lm/wattcreates new standard in spotlight with 2500k 4W GU10 and GU5.3. 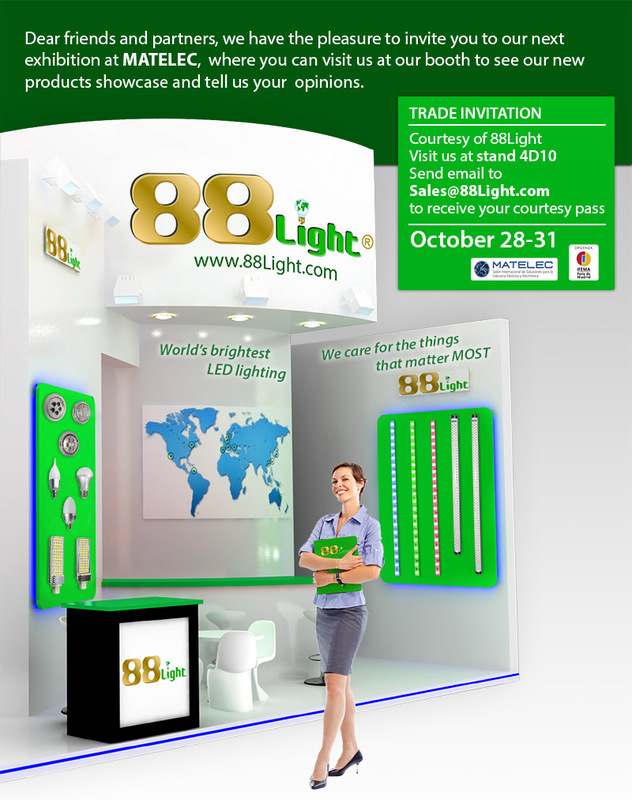 88Light expands its network to Canada and Mexico.